This week, CCFC sent letters to the Superintendents of Education for each of the 42 states where Channel One has a “significant presence”. Exactly. A big reason so many kids are failing in school is because they are spending a huge amount of time watching TV (kids spend, on average more time watching TV than they spend in school). Schools using Channel One are sending the message to parents and kids that watching TV is good for kids. I just sent my email, I hope you’ll do the same! Categories: Marketing to Children, Television | Tags: CCFC, Channel One, Channel One News, Education, Television, TV ads | Permalink. 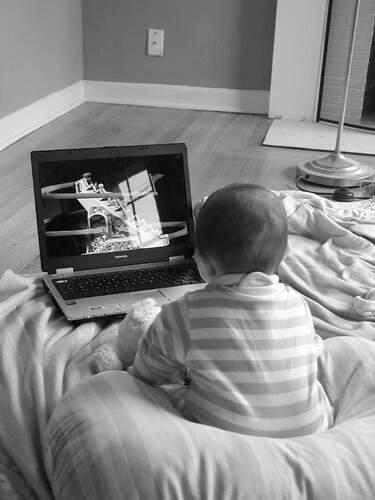 Baby Einstein, a photo by khara on Flickr. Categories: Kids, Marketing to Children, Television | Tags: Baby Einstein, Campaign for a Commercial-Free Childhood, CCFC, Kellogg, Scholastic, Walt Disney | Permalink. 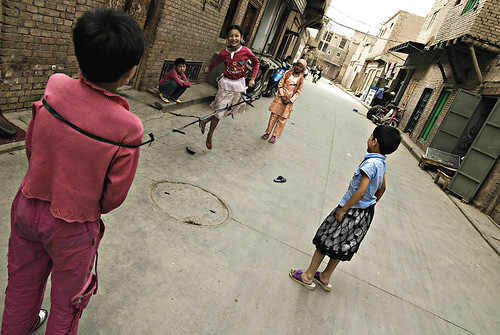 Children playing, a photo by Pawel Maciejewski on Flickr. Wow, CCFC has done a masterful job getting the word out on Screen-Free week. – Read Boston has asked 4,000 students in 12 partner schools to take the screen-free pledge! Children who return their tracking logs after break will receive a prize pack with items that promote fun (and learning) without screens. – Screen-Free Kansas City and the Early Years Institute in Long Island have both partnered with local businesses to offer discounted and free fun activities every day of Screen-Free Week! – Unplug and Play in Bozeman, Montana has organized daily events including free admission to the Museum of the Rockies, a Bike Rodeo, and Family Science Night at the Children’s Museum. – Portland (Oregon) Parks and Recreation and Kaiser Permanente are offering activities including a tea party for young children, Family Game Night, and Messy Art! Categories: Kids, Turn-off Week | Tags: Campaign for a Commercial-Free Childhood, CCFC, Family Game Night, Flickr, Kaiser Permanente, Museum of the Rockies, Screen-Free, Screen-Free Week | Permalink. The “National Association for the Education of Young Children” and the “Fred Rogers Center” have come out with a new position paper on technology use in the classroom. The NAEYC’s is a highly influential organization, with nearly 80,000 members (according to their website). “NAEYC convenes thought leaders, teachers and other practitioners, researchers, and other stakeholders and sets standards of excellence for programs and teachers in early childhood education.” Their position paper are important because teachers and schools all over the country take their recommendation into consideration when deciding how to teach and what tools to use in the classroom. Last year’s position paper was very pro-screen time in the school and daycare centers. The CCFC presented a letter at the yearly NAEYC conference signed by 70 doctors and experts making a number of criticisms and recommendations for improvement. The NAEYC seems to have taken this letter and other public pressure into consideration. Their latest position paper “Technology and Interactive Media as Tools in Early Childhood Programs Serving Children from Birth through Age 8” is much more balanced. Nevertheless, they still fall short in a number of ways. How should the CCFC respond? That is the question that the CCFC is putting to their members and to the public. Here is your chance to influence CCFC to pressure the NAEYC to make stronger recommendations on limits to screen-time. Categories: Kids, Television | Tags: CCFC, Early childhood education, Interactive media, NAEYC, National Association for the Education of Young Children, Rogers Centre | Permalink.